John and Frank Germack (Sr.) came to America through New York’s Ellis Island in 1912 at the ages of 12 and 7, respectively. Longing for a taste of their homeland, older brother John started a business in Brooklyn, then in New York City to sell traditional food imports to the growing population of Turkish, Greek and Eastern Europeans making their way to the US. Some of their products included olives and olive oil, spices and various nuts. Pistachio nuts, extremely costly and a delicacy in the Mediterranean, were new to many in the US. Frank joined the company, and the two brothers sought other locations to grow the import business. The company imported products into New York, and then Detroit. Detroit was a booming industrial town, and immigrants and locals provided steady business for the imported delicacies. 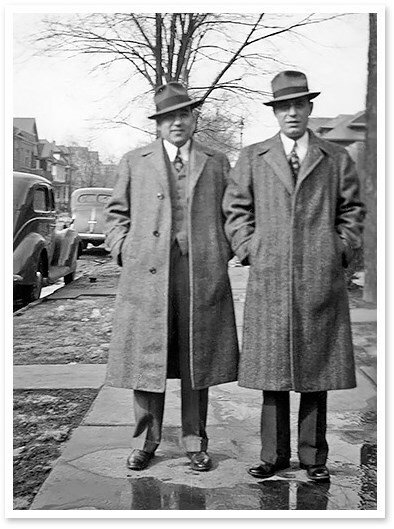 Younger brother Frank (Sr.) remained in Detroit, where the imported pistachios were roasted while John acquired another nut company in 1936 named Zenobia, and moved back to New York City (Zenobia was later sold by John Germack, but remains in business today). John Germack (left) with Frank, Sr.
Frank Germack Sr. focused the company entirely on the import and roasting of Pistachios as well as other nuts, including Brazils, Cashews and Pignolia (Pine) nuts. Many of these nut varieties were also new to the US. In addition to processing imported and domestically grown nuts and seeds, he had the novel idea to dye pistachios a bright red color. This was done for two reasons – first, improved aesthetics which attracted new consumers to the product, but also to cover the naturally occurring stains left on pistachio shells from the nut’s outer husk, which is removed at the time of harvesting. These red nuts were sold in penny vending machines during the depression, which offered those hard on their luck a treat that also packed some essential protein and fiber. Although un-dyed or natural pistachios were processed as well, red pistachios soon became a hallmark of the company and fueled the ongoing debate of pistachio preference, natural or red. 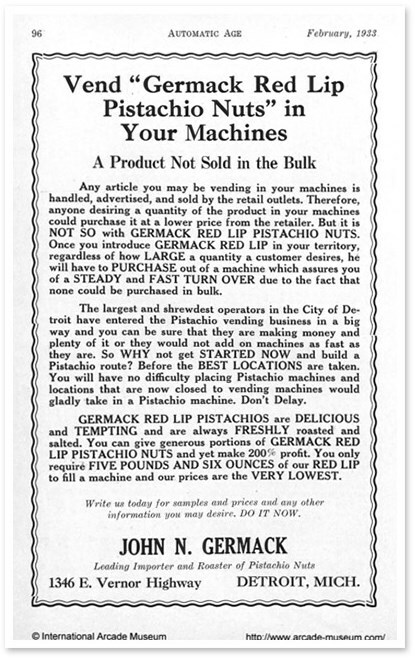 Red pistachios were renamed “Red Lip” pistachios by Frank Sr., who incorporated the phrase in packaging and promotions. In the ’50 and 60’s, the company moved from the regional market to a national producer of nuts. By the 1960’s, the Germack’s were importing 20,000 tons of pistachios, or more than 40% of the entire crop of three exporting countries. Helping Frank Sr. was Frank Jr. – now back from a tour of duty in Korea and finished with a Law Degree from the University of Detroit. 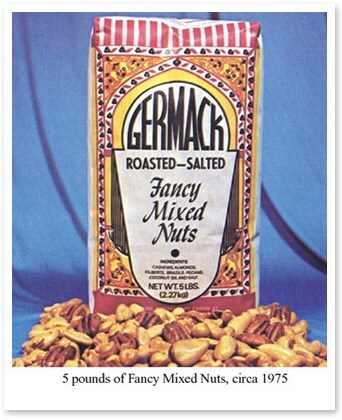 Frank Germack Jr. grew the Company by specializing on a select list of nuts and seeds which were always processed and shipped within days, often times arriving still warm from the roaster. He used the buying power of the company to ensure the highest grade and freshest product. Finally, he used his sales skills to convince national retailers to carry nut products in the Company’s signature 5 lb. paper bags, a much larger package than otherwise available - the only other size was a round vacuum packed 12 oz. tin of Pistachios. The factory became a destination for Eastern Market shoppers seeking the fresh roasted product, especially during the Holiday Season. The company operated out of facility in the Eastern Market on E. Vernor Highway (later renamed E. Fisher Freeway for the new highway system built at the time). The factory had two floors – the top for roasting, and the main floor for packing, storage and a retail store. Much of the roasting process was done by sight and taste, as nuts had different characteristics even between batches of the same type of nut. Pistachios were roasted in cylindrical rotating ovens, and then the nuts were salted and dyed in mixers before cooled and packed on the floor below. 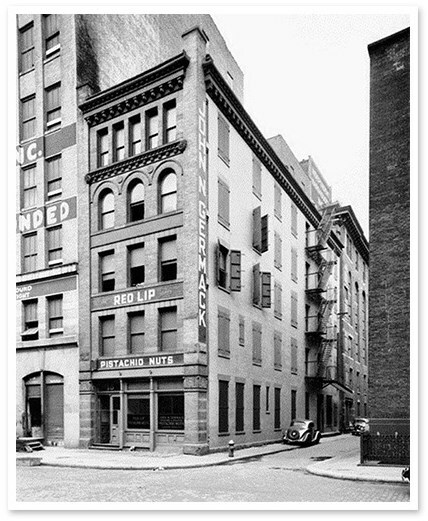 In 1976, the neighboring Stroh Brewery acquired the entire 1300 block of E. Fisher to expand their brewing operations, and the Company moved to St. Aubin and E. Milwaukee St.(below) Here, a state of the art factory was built with the capacity to handle the thriving international business. Under Frank Jr.’s leadership, the Germack Pistachio Company was able to compete with conglomerates that were steadily entering the nut processing market. He became known internationally as an expert and was invited to share his knowledge of the business with other countries that sought entrance into the nut processing business. In 1980, the City of Detroit tore down the building and hundreds of other structures in the area to create an industrial park operated by General Motors, Cadillac division. The factory was moved once again, this time to Bellevue Street in the shadow of the former Packard Motor Company complex. (below) In 1984, a street improvement project cut off access to Bellevue street from larger avenues, so the company sought a new location. In 1985, the company returned to East Fisher Freeway in the Eastern Market, not more than 50 yards from the location of the original factory. The retail store is at this location, while a newer factory was acquired in 2000 to better accommodate roasting, shipping and cold storage. 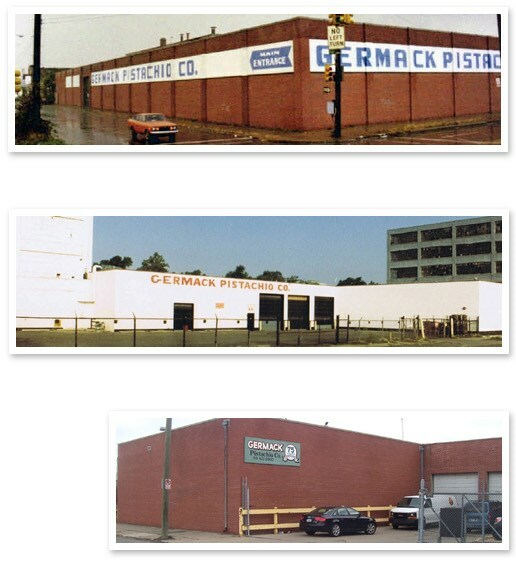 The company has endured into the third generation, and now the fourth generation of Germacks. 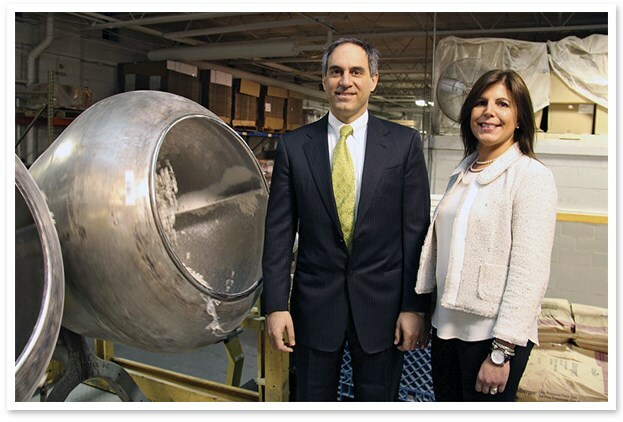 Germack Pistachio Company co-owners Frank Germack III and Suzanne Germack Fredrickson inside the production plant. With changing consumer tastes, Germack Pistachio has added over 100 new products including dried fruits and healthy mixes, in addition to gourmet chocolate covered nuts and special Christmas items. We are also one of the nation’s largest producers of squash (pumpkin) and sunflower seeds. We are proud to be a partner with Detroit’s professional sports teams by supplying peanuts for the Tigers, Red Wings, Pistons and Lions home games. We are a QVC Network © vendor and work with various distributors and direct sales partners to service our expanding business. Our mission is to provide the freshest and highest quality product, and maintain our leadership position with superior service. We are committed to our customers’ satisfaction and are loyal to our roots in the City of Detroit and in Michigan.